Super Typhoon may hit Manila! Be warned people, PAGASA says the super typhoon Mina (which has an area that blocks out the entire Luzon!) will be making land fall over the weekend. Stock up on emergency supplies like cash, water, batteries and food. Mina might be the next Milenyo. Signal no. 3 is already up in most of Region 5 and these areas are expected to be worst hit, provinces closer to Manila are only up to Signal no. 1 while Manila may already have a Signal raised by Sunday. As a precaution, why not try to board up windows and trim trees before Sunday just to stay safe. A lot of problems caused during Milenyo was due to trees falling on power lines, call Meralco if needed. If you have Ad Billboards still up in your area, you may try to report them to the MMDA. Stay safe everyone. Three of the biggest coffee chains in the Metro are going head to head with their Christmas Planner Giveaway. 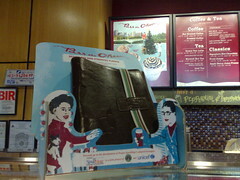 Coffee Bean and Tea Leaf is giving out a notebook (available in 3 designs), Starbucks Coffee is giving out a planner (leather bound with ball pen) while Seattle’s Best Coffee is giving out a tote bag, notebook, mug, ball pen, gift coupons and metal casing (kitchen sink not included). Here’s a quick guide on the three Holiday promos. Feel good Factor? Starbucks Coffee has had a long tradition with their Christmas Planner which started around 2004. A contribution to the foundation Spark Hope is made when you complete your planner. It’s 4pm on a gloomy Thursday afternoon and you’ve had separation anxiety with your bed since you left your home. What would help you through the rest of the day? Is it that chicken mami cup noodle? Or some sort of instant champurado? 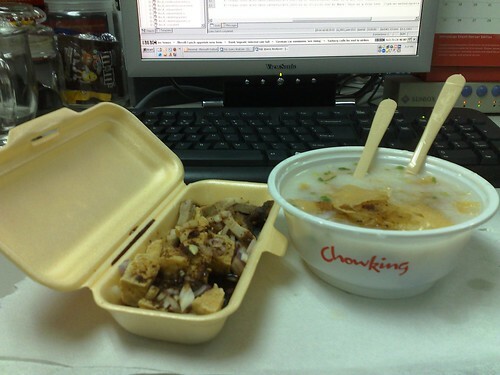 Why not skip the pre-packed copy cats and have a nice hot bowl of Congee and Tokwa’t Baboy (Tofu with Pork), Metblog’s guaranteed instant cure to gloomy weather. So yesterday I spent one and a half hours on a FX bound for Quiapo and another 2 hours on a jeep going home. Fifteen minutes was spent waiting for said FX, while close to 30 minutes was my wait for a jeep that wasn’t packed with passengers. I walked for 8 minutes, from where the FX dropped me off to my destination getting lost in the process, while the walk back to where they jeepneys are took just 6 minutes. All that just so I can spend 30 seconds at the NBI office in Carriedo to get my clearance. Hour-long downpour + Quezon Boulevard + rush hour = a very tiring day. Flying U-Turns soon in Metro! U-turns that currently dot the metro’s amjor throughfares will soon have your cars flying – that is they’ll be turning into elevated u-turns. The first one will be placed in the heavily clogged C5-Kalayaan interchange (which causes a daily serving of Southbound traffic from Quezon City to Pasig and Makati). The MMDA is targeting the project to be completed April of next year. I guess the only question left here is if the flyover will be pink? Posted in Living in Manila | Comments Off on Flying U-Turns soon in Metro! While everyone (myself included) is going gaga over the 28th Manila International Book Fair this August 29 to September 2, others (myself included) are muttering the same word -though you’d have to replace the last letter with an o– as the adjective with which they would describe MMDA Chair Bayani Fernando after his latest implemented rule. No more U-turn slots along C-5. Happy reading and see you there!